Are your mornings rushed and hectic? Imagine if you could do the bulk of your breakfast making the night before! 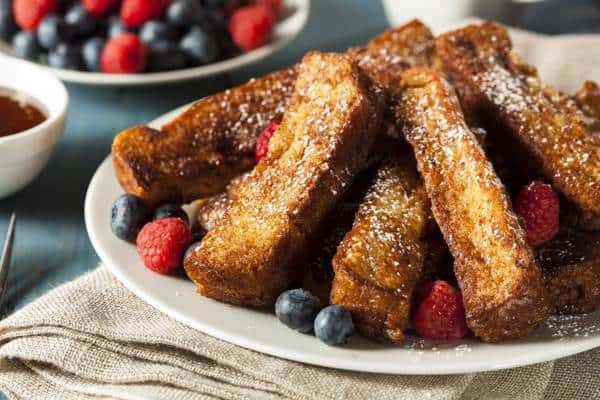 With this healthy recipe for baked french toast, you can do just that. All the work is done the night before, and you can bake it off in the morning while you take your shower and get ready for your day. 1. Lightly grease a 13x9x2 inch baking pan. Cut each slice of bread into 2 even strips. Arrange bread strips in pan. 2. In large bowl, mix eggs, milk, sugar, and vanilla with an electric mixer on low speed until well blended, about 5 minutes. 3. Pour egg mixture over bread strips; cover. Chill 4 to 24 hours. 4. Preheat oven to 425 degrees F. Bake until eggs are set and toast is lightly browned, about 30 to 40 minutes.